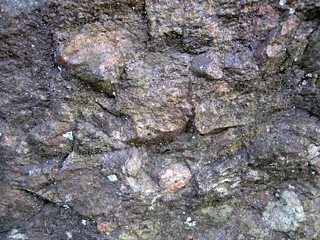 Conglomerate in the Precambrian of Virginia, USA. This rock outcrop consists of late Precambrian-aged conglomerates of the Mount Rogers Formation, a mixed siliciclastics-volcanics interval exposed in the Blue Ridge Physiographic Province of southwestern Virginia. The lavas and sedimentary rocks were deposited in an ancient, failed, continental rift valley that formed when the Rodinia supercontinent tried to break apart. Rodinia formed at about 1.1 billion years ago. It broke apart into two large pieces, which later collided to form the supercontinent Pannotia in the latest Precambrian. The rift valley experienced significant volcanism, principally in the form of rhyolite lava flows, plus rhyolitic volcanic tuffs and volcanic breccias. Between eruptions, the lava flows and the rock outcrops in the uplands adjacent to the rift valley were eroded to produce significant volumes of sediments. These are now conglomerates, arkoses, sandstones, and some shales. 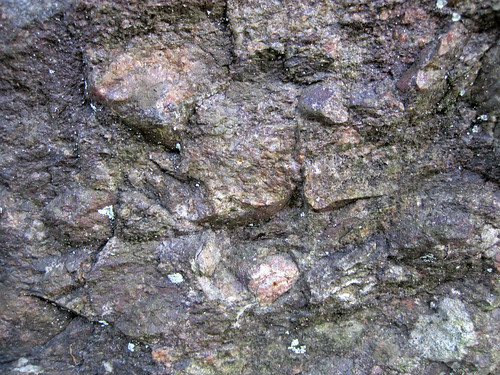 The multicolored rock shown above is a polymict conglomerate, which refers to the presence of a variety of clast lithologies. Oberved clast types include granite, porphyritic rhyolite, sandstone, greenstone, serpentinite, and milky quartz. The pink-speckled granite pebbles are derived from the basement rocks of the Cranberry Gneiss (Mesoproterozoic, 1.0 to 1.3 Ga). Many of the rhyolites are porphyritic and dark maroon-colored - they are the same lithologies present in the rhyolitic lava flow-dominated sections of the Mount Rogers Formation. The greenstone and serpentinite clasts are metamorphosed mafic rocks and ultramafic rocks, respectively. The milky quartz pebbles are probably from white vein quartz. The conglomerate was deposited in an alluvial fan environment.